Jordan Peele blew everyone away with his 'social thriller' Get Out, and it sounds like his new horror film Us is about scare the bejesus out of people too. 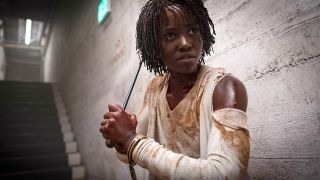 In a new interview with Total Film magazine, Lupita Nyong'o admitted she got stressed just reading the script, while Jordan Peele calls it his tribute to Dr. Jekyll And Mr. Hyde myth. "The script was totally surprising, Nyong'o tells Total Film. "I knew it would be something special because Jordan had written it, but it was nothing like Get Out. The storyline was so intriguing. It was a totally new kind of nightmare – and a nightmare it was. I was very stressed-out reading it. I read it in one sitting and I just remember being terrified. So yeah, I was all in." Nyong'o plays Adelaide Wilson, the matriarch of the family at the center of Us. As you've probably spotted in the trailer, she also plays Adelaide's doppelganger, a creepy figure with a worrying attachment to some serious-looking scissors. "The underlying theme I’m going with is that we are our own worst enemy, and the doppelganger is about the monster within,” Peele, tells Total Film. "I think of Get Out as being my Frankenstein and this is my tribute to Dr. Jekyll And Mr. Hyde. I felt that that was the right idea to be working with in today’s day and age; the idea that, though our fears are set on the outsider and the invader, the real enemy is already here and has our faces." Us will be released on March 22, and the latest issue of Total Film is out now. Subscribe to Total Film magazine now and you’ll never miss an issue (and you'll save money on the cover price). Get the digital version for your tablet or have an exclusive subs cover through your door every month - or save even more with a print/digital bundle! Grab your first issue FREE direct from Apple Newsstand. Or read our Android version on Google Play.